Scott Harper, of GAB News, encouraged me to do a special Valentine’s column where I interview a couple who has been married for a long time. I thought it was a fabulous idea, however, I did not think I would get much of a response as people do not seem to stay married for very long anymore. That couldn’t have been farther from the truth. The response was overwhelming, yet, inspiring. 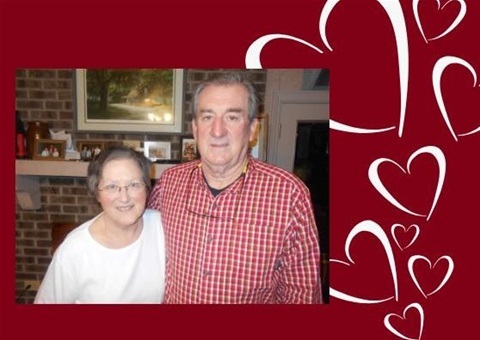 There were so many responses, mostly from children proudly proclaiming, “My parents have been married _____ years!” It was truly so amazing that I’ve decided to write about a few of these old time honeymooners starting with Frankie and Harriette Davis, of Georgetown. They graciously welcomed my husband and me into their home. As we all gathered around, I explained what I was doing and how we would just sit around and talk and then I’d go home and write about it. “And Harriette was one of them…” I added more as statement than question. He spoke a little of how the families were unsure because they had only just met and didn’t know each other very well. However, the families did come together about the nuptials. Frankie expressed how he was so touched that his family had graciously accepted Harriet with so much love. “You knew when you met that she was the one you wanted to spend the rest of your life with?” I was surprised because I was the same when I met my own husband. “Yes, I knew she was the one,” he confirmed. “Did you know?” I asked of Harriette. “No, I didn’t know. He had to talk me into it,” she said with a chuckle. “Well, what is the age difference?” I asked in the midst of the dating conversation. “I’m 72; he’s 70,” Harriette answered. “I haven’t had my birthday yet this year. She’s about a year and a half older than me,” Frankie explained. The four of us talked for quite some time. They shared with me that while Harriette worked as an office manager and receptionist for the hospital and later for Doctor Varn, Frankie worked as a contractor. He’s done plumbing, built homes, and helped others build homes. In between all of this, they raised two children together. We all agreed that couples today do not respect the vows they took at the altar. “To love, honor, and respect each other for better or worse, richer or poorer, in sickness and in health.” Young couples today are too worried about things that do not matter. I agreed. It helps to solidify the bond between husband, wife, and family. “Fifty years,” I thought as I wrapped things up. They are so right! I can only pray that my husband and I are as fortunate as Frankie and Harriette Davis. We bade our goodbyes amidst the hilarious Chips vs Hardees banter. In Harriette’s defense, I was 16 when Hardees was built in the spot it’s at now. Before then, there was an A-Frame building standing there. Everyone agrees that Chips was the A-Frame building. That being said, Hardees has been in that particular location for thirty-seven years. These two were a pleasure and an inspiration. Thank you for letting me write about you. Happy Valentine’s Day, and I pray for you to have many more.